Etches to produce the LNER Quad bogie bolster. This has been designed to be an easy to build brass etch. 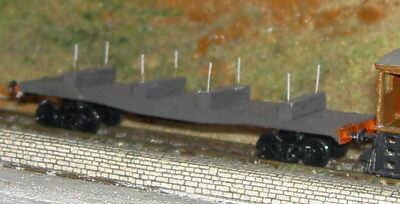 You will also need a pair of suitable bogies and buffers (eg Farish round buffers) plus some plasticard and wire to assemble the bolsters. An etched guide is provided to make it easy to cut them to size and get the holes in the right spots, the wagon deck is also clearly marked out for fitting.